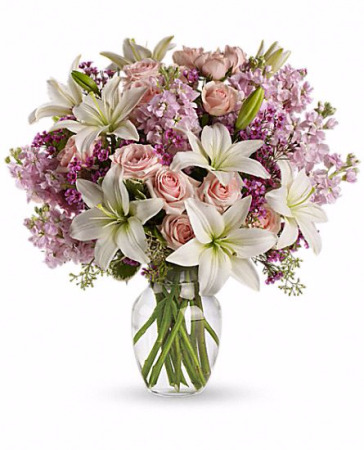 White Roses, Oriental Lilies, Lisianthus And Sweet Pea Are Contrasted With Light Pink Roses And Stock And Rich Green Salal, The Classic Arrangement Is Delivered In A Graceful Clear Glass Vase, Orientation: Onesided. 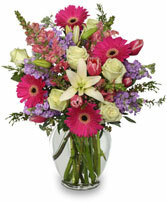 Let REDLAND'S BOUQUET FLORISTS & MORE deliver a beautiful surprise for you today!! 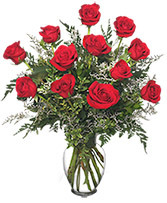 This vase of brilliant "large, long stemmed red roses" is an elegant and natural way to say, "I love you." 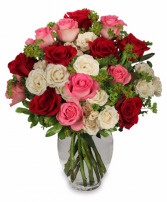 Classic Urn Vase, Foliage: Variegated Pittosporum, White Miniature Spray Roses, Red Miniature Spray Roses, Pink Miniature Spray Roses, Bupleurum. Ginger Jar Vase, Hot Pink Gerberas, Ivory Roses, Lavender Stock, Pink Snapdragons, Hot Pink Tulips, White Asiatic Lilies, Pink Heather.